The Singapore Grand Prix wasn’t a classic by any means. Lewis Hamilton took a good step closer to the title with a dominant victory, but while the 2018 title fight is starting to fizzle out, there is already plenty to get excited about for 2019. This year’s driver-transfer market has probably been the most interesting I can remember. There have been so many switches, resulting in plenty of new pairings and match-ups that will be fascinating to watch in 2019. It looks like of all 10 teams, only Mercedes will remain unchanged. The most exciting changes for me are two movers into top teams – Charles Leclerc to Ferrari and Pierre Gasly to Red Bull. It is always interesting to see new, young faces in top drives, and down the years it’s actually been very rare that a young star has failed to deliver when a top team has taken a risk on them. In the last decade, Red Bull took a chance with Max Verstappen, Daniel Ricciardo, Sebastian Vettel and McLaren with Lewis Hamilton, and all went on to win races or championships for those teams and be extremely successful. The only exceptions have probably been Daniil Kvyat – who arguably was promoted too soon at Red Bull in 2015 and subsequently dropped – and Heikki Kovalainen, who replaced Fernando Alonso at McLaren in 2008. Kovalainen won a race and Kvyat had a few podiums, but they both failed to reach the heights expected of them at the time of the move. All in all, the stats say that teams who make bold driver choices benefit from them. I think it’s not only good for the sport to see new faces in the hunt to win races in the top teams, but it’s also good for those teams as well. A couple of months ago, Vettel stated a preference to retain Kimi Raikkonen as his team-mate next year. Of course he would. As a driver, you are always compared to your team-mate and Vettel has had the measure of Raikkonen for four years now. Raikkonen is a fair driver, who doesn’t involve himself in too much politics and gets on with Vettel. It’s a harmonious relationship within the team, but a fresh new youngster will be a different thing for Vettel to deal with and he may need to up his game again. After Vettel had won four straight world championships at Red Bull, Ricciardo replaced the retiring Mark Webber as his team-mate in 2014 and immediately beat the German, in a team that was built around him after a dominant era. Ferrari are poised to see another title slip through their hands right now as Hamilton seems imperious and Vettel has made a few too many mistakes in comparison this year. Vettel’s errors ultimately may end up costing him this title, but overall he has been extremely good. The fact he is still 67 points ahead of Raikkonen in spite of those mistakes tells you the level he can operate at. But Hamilton’s season has been unbelievable, faultless; his best in Formula 1 in my opinion. Fresh motivation and impetus in the team for next year in the form of the very promising rookie Leclerc is a big step in the right direction for Ferrari. Red Bull’s case is different because they were forced to replace Ricciardo after his decision to switch to Renault. I’m sure Red Bull would have preferred to keep their race winning Australian, but Ricciardo’s surprise switch to Renault (another exciting prospect and story for the neutral to see in 2019) meant they had a natural choice between Gasly and Carlos Sainz. They chose Gasly, another driver with an impressive rookie campaign under his belt at Toro Rosso, and I look forward to seeing how he gets on alongside Verstappen next year. Like Ferrari, Red Bull are a team who need a fresh new impetus after a disappointing season this year. A switch to Honda engines for 2019 is a big deal, but a new driver line-up will also give them a fresh start to build for the future again in a new era for the team. Overall, it’s been a positive driver market, with plenty of changes at the front end of the grid, and still some seats to be settled further back as well. But there’s a log jam of extremely good talent coming through that is a bit of an underlying frustration, mainly for Toto Wolff, whose Mercedes team have plenty of them on their roster. Esteban Ocon, a Mercedes junior, is set to lose his seat at Force India and have no 2019 F1 drive at all. This would be a big shame for the sport. And George Russell, the current Formula 2 championship leader, is struggling to make the natural step up to F1. For Ocon, his performances have made him worthy of a top drive in F1, but he has the doors closed off from the main Mercedes team for next year at least by their decision to retain Hamilton and Bottas for 2019. Russell, meanwhile, is below Ocon in the Mercedes pecking order. Recent reports have linked him to a seat at Williams for next year to replace Lance Stroll, who is surely bound for Force India – now owned by his father. If Russell and Williams can make a deal work, it would be a great step for the promising Brit. A seat in F1 is unbelievably tough to achieve. There are only 20 in the world, and at grass roots go-karting there are millions of young drivers who all aspire to get there at what will be a cost that varies between reasonable and huge. Only once I was winning GP2 – the forerunner of F2 – in 2014 did I think it could realistically happen. Every step a driver moves up the ladder, the dream becomes more of a reality. But even winning F2 is not enough these days. When I was GP2 champion in 2014 I needed a year as an F1 reserve in 2015 to get a chance (as well as a reasonable amount of good fortune). It was the same for both Vandoorne and Gasly in the following years. That’s why there’s a frustration when drivers who are under performing stay in F1, because the talent pool coming through is so vast and so good. Raikkonen signing for Sauber on a two-year deal is a strange one for me, and many in the paddock were surprised by the move as well. Having driven in top F1 machinery since his switch to McLaren in 2002, Raikkonen is stepping back to a midfield team, with next to no hope of a podium despite Sauber’s recent progress. 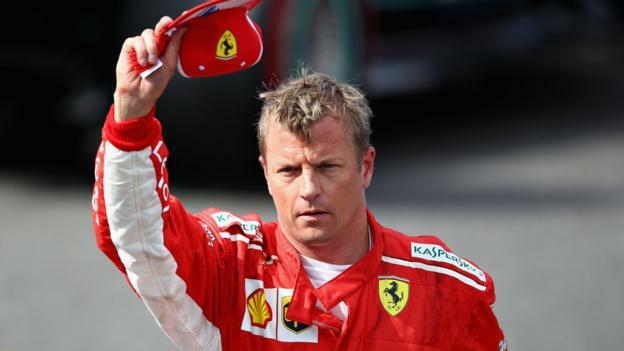 Yes, Raikkonen was on pole at Monza earlier this month, setting the fastest lap ever set in a Formula 1 car, narrowly pipping Vettel and Hamilton. But that was only his second pole position in more than 10 years, while Vettel has had five this year alone. On the whole, Raikkonen has had a brilliant F1 career. I remember growing up watching him putting in some mesmerising performances for McLaren, before winning his title with Ferrari in 2007. And he has generated a huge and loyal fanbase with his trademark ‘ice man’ personality. But the results haven’t been there of recent years. He hasn’t outperformed a team-mate since the first half of 2013 against Grosjean in the Lotus. In 2014, he scored a third of the points of team-mate Fernando Alonso on his return to Ferrari. Mercifully for him, Alonso left at the end of the year and he has been closer to Vettel since. But only in 2016 has Raikkonen got within 100 points of his team-mate at the end of the year. This year is going a similar way, with the gap between the two up at 67 points now with six races left. Raikkonen will be 41 by the time his two-year contract at Sauber expires, and with drivers’ careers extending ever further it makes it that much harder for new talent to make the grid. If they are still at the top of their game, as Alonso appears to be at 37, with a brilliant seventh place for McLaren in Singapore on Sunday, then of course there’s no reason to stop. Although, ironically, Alonso has decided to call time on F1 at the end of the year. But for Raikkonen, bar the odd flash of pace, it feels like his best was a while ago. Nonetheless his experience could help Sauber develop in the short term, as long as he can retain motivation in a car in which he will probably do well to score points. And although it’s surprising, it is nice to see that Raikkonen really is still in love with F1 and the thrill of driving. The final exciting mover over the summer, especially from a British point of view is Lando Norris moving to McLaren to replace Vandoorne. I have sympathy for Vandoorne because I know how good he can be, and for some reason he hasn’t been able to deliver that at McLaren against Alonso. I hope he can find a seat elsewhere to prove himself, but it isn’t looking too likely right now. Norris, on the other hand, is a reason for British fans to get excited. Currently second in F2 behind Russell, he has won every single-seater category he’s raced in at the first attempt. While he’s enjoyed a vast amount of testing in all series he’s competed in as well, he’s made the most of it with some dominant displays. His ability in the wet is plain to see, and for me that signals a natural talent, an innate ability to find grip and balance within a car. That’s the stuff that you can’t really teach a driver. With McLaren going backwards this year, it isn’t ideal timing, but as I said above, just to get into F1 is phenomenally hard in itself and Norris now has a platform where he can show off what he can do to the world. When Hamilton won GP2 and was promoted to McLaren in 2007, he had the benefit of a lot of testing and a race-winning car. Norris will not have either, but he will also have less pressure and that can have benefits as well. The icing on the cake for the UK and motorsport on the whole would be for Russell to join him on the grid, making three British drivers for the first time since 2016.